From the outset of the draw, the most anticipated potential third round encounter was Roger Federer against Juan Martin Del Potro. The fans got their wish since these two will battle it out for a fourth round berth. 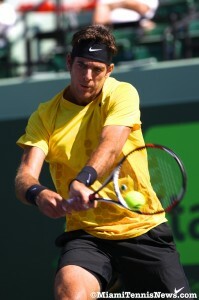 Secondary to injury, Del Potro has off the tennis circuit for long stretches at a time the last four years. The last time Federer and he collided was in 2013 at the Barclays’ world tour finals. Federer holds a 15-5 record over the Argentine. As always the X-factor is the South American fans. Without question, the stadium will be sizzling which means anything can happen. After the heights of Federer and Del Potro, John Isner clashes with youngster Alexander Zverev. The 19 year old, currently ranked 20th, won their sole prior meeting at the 2016 ATP Masters tournament in Shanghai. For the women, the daytime’s most compelling match is Garbine Muguruza taking on former world number one Caroline Wozniacki. The 2016 French Open champion clawed her way to this stage needing three sets in both matches while Wozniacki sailed through. Muguruza has a 3-1 lead in their head to head. However, the two have not competed against each other since 2015. Top seed Stanislas Wawrinka has the honor of opening the night session against 33 year old Tunisian veteran Malek Jaziri who is this far at Miami Open for the first time. He has a Herculean task in keeping his hopes for a fourth round spot alive as the two meet for the first time. The night ends with two former Miami Open champions Venus Williams and Svetlana Kuznetsova duking it out for a quarterfinal spot. They’ve fought it out on court nine times previously with the Russian banking 5 wins over the American. With the women seeking advancement to the quarterfinals, there is a plethora of interesting matches to pick from on Monday including world number one Angelique Kerber’s and second seed Karolina Pliskova’s. Click here for for Monday’s complete order of play. 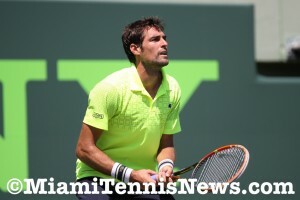 The first day of main-draw action in men’s singles at the 2014 Sony Open saw Jeremy Chardy outlast Juan Monaco in a thriller on Stadium court. Chardy prevailed 7-5, 3-6, 7-6(5) after two hours and 38 minutes to set up a second-round date with second-seeded Novak Djokovic. It almost ended prior to a final-set tiebreaker, when the 48th-ranked Frenchman forced Monaco into a 15-40 situation at 4-5. Monaco saved the first match point with a serve-forehand combination and Chardy netted a backhand on his second opportunity. Two holds later, a ‘breaker had to decide the outcome. The Argentine fought off one more match point at 4-6, but Chardy finally got the job done at 6-5 thanks to an overhead smash. 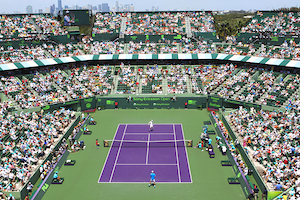 Miami’s Stadium crowd was treated to another tense three-setter during the night session. Amidst a lively atmosphere, Marcos Baghdatis recovered from a dismal opening set and from two breaks down in the third to overcome Santiago Giraldo 1-6, 6-2, 7-5 in one hour and 51 minutes. Giraldo served for the match at both 5-2 and 5-4, but the Colombian failed on both occasions and he ultimately lost six straight games to Baghdatis to seal his fate. It was just Baghdatis’ fourth victory of the season. The struggling Cypriot will next go up against Philipp Kohlschreiber on Friday. Giraldo was not the only Colombian action on Wednesday. Whereas not a single American man took the court (six are scheduled for Thursday on the other side of the draw), three Colombians contested their openers. Alejandro Falla lost to Marinko Matosevic 1-6, 6-4, 7-6(6) and Alejandro Gonzalez took care of Malek Jaziri 7-6(9), 6-1. The Grandstand featured a pair of stellar individual performances. Red-hot and fast-rising Dominic Thiem powered past recent Irving Challenger champion Lukas Rosol 7-6(6), 6-4. The 20-year-old Austrian, who qualified for the main draw for his fifth successful tournament qualification already this season, won 86 percent of his first-serve points. At the other end of the career spectrum, 35-year-old Radek Stepanek donated fewer games than any other man in a 6-3, 6-0 rout of Daniel Brands. Stepanek required a mere 57 minutes to book a spot alongside Andreas Seppi in the round of 64. Ricky Dimon is a contributor in Miami and writes for tenngrand.com. You can follow him on Twitter under @RD_Tennistalk by clicking here.